Am I eligible under the NDIS? For more information (Access to the NDIS) click here. Once you are confirmed eligible by the NDIA and before you meet your planner, think about what you want and need. What support do you need to do everyday activities? 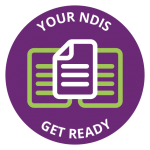 How can the NDIS help you? Discuss these questions with your family, friends or carer, as well as Braille House. Braille House can support you to plan for your future. The best time to talk to Braille House is at this preparation stage. Our people will work with you in establishing your short and long term goals and the supports you will need to achieve them in preparation for your NDIS planning meeting. This pre-planning will give you the confidence and understanding to work with the NDIA in establishing your support to achieve your goals.